With Mother's and Father's Day approaching, nothing says "I love and appreciate you!" like a home cooked meal! Here's our favorite recipe for juicy, flavorful chicken and turkey! Preheat oven to 375 degrees. Unwrap bird, place breast up in a roasting pan, and remove giblets/neck from body cavity, Fill cavity with butter and celery. Thoroughly rub seasoning into the bird's skin, sprinkle with salt and pepper. 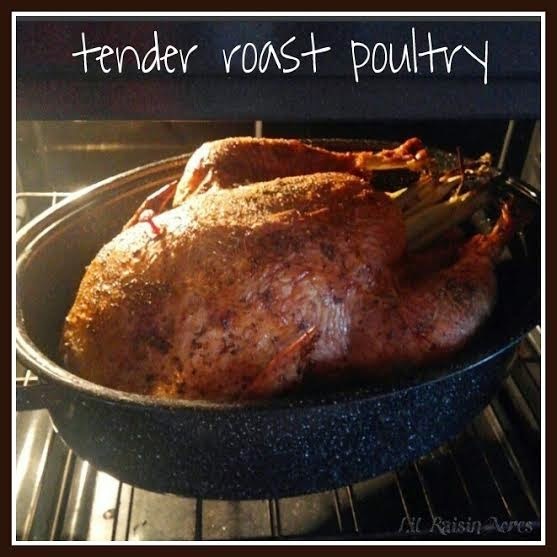 Place uncovered roasting pan in oven for approximately 20 minutes per pound plus an additional 20 minutes (A 3lb chicken would take about 1 hr 20 mins), or until an internal temperature of 180 degrees is reached. (Store bought turkey generally has a small plug indicator that pops up when the appropriate temp is achieved.) Baste bird with pan juices every 30 minutes during cooking. Let roasted bird stand for 15 minutes before carving. 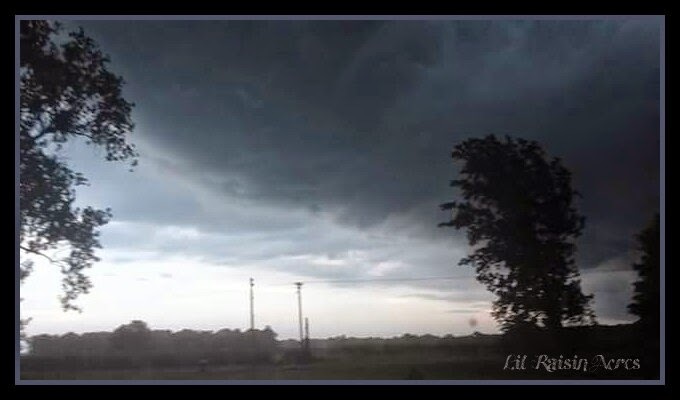 A Storm Approaches - Be Prepared! I've said it before, shows like "Doomsday Preppers", in my opinion, has cast a negative light on emergency preparedness within the general population. After all, most people today are accustomed to walking or driving a short distance to the nearest convenience or grocery store for bread, milk, snacks and toiletry items on demand. They can't imagine a time when they won't be able to do so. While being preoccupied with laughing at Joe Smith hoarding gas masks and building a fall out shelter under his garage, or Pete Jones building an arsenal fit for any 3rd World Army, they are forgetting about possible every day negative occurrences like natural disasters and localized pockets of civil unrest, or even a personal period of illness or unemployment when funds to purchase food may be scarce! As I stated previously, a good place to start preparing in case of emergency is the American Red Cross. They provide lists of supplies to have on hand, and tips for specific types of emergencies. While they concentrate on natural disasters, your basic human needs are the same regardless of the situation. Agencies across the board recommend AT LEAST a 72 hour stash of supplies, preferably mobile in case of evacuation. 72 hours is a great place to start, and from there, in my opinion, keep going until you reach at least 30 days. Pinterest offers a plethora of links to sources with thorough supply lists and tips for specific scenarios, too. Here's a link to our Emergency Preparedness Board. As you can discern from the pins, our biggest threats out here are tornadoes (all these open fields! ), and most especially impassible roads and power outage due to blizzard conditions. Winter 2013, there were 3 separate times we were snowed in for more than 24 hours. It was a blessing knowing we had plenty of food and water, and warm clothes, blankets and an alternate cooking method if the power went out, too! There are many companies out there offering pre-packed mobile 72 hour bucket and backpack kits. A quick Amazon search will yield hundreds of results. Though convenient, these pre-packed kits can be rather pricey. If you have a dehydrator and the time to do so, you can easily make your own dry mix meals and package them in mylar bags with oxygen absorbers for long term storage, and invest in some water treatment tablets or a LifeStraw Personal Water Filter for your mobile kits. Besides the obvious Amazon, a great place to find non-food supplies, like alternate cooking sources and solar crank radios at affordable prices is Sportsman's Guide. While, as their name suggests, they sell hunting and fishing gear, they also have an excellent selection of military issue surplus and camping goods that could be helpful in an emergency situation. I could go on about this topic for pages, however, my intention here is to simply encourage you all to start concocting a contingency plan for yourselves and your families, and guide you to some resources, if God forbid, things ever go south for you, regardless of the actual situation that may cause the emergency. Coincidentally, I started on this large batch of broth on the eve of Earth Day, a time when there is quite a lot of discussion about food waste and sustainable agriculture. Here's a great way to cut down on waste, and get delicious soup stock in the process! 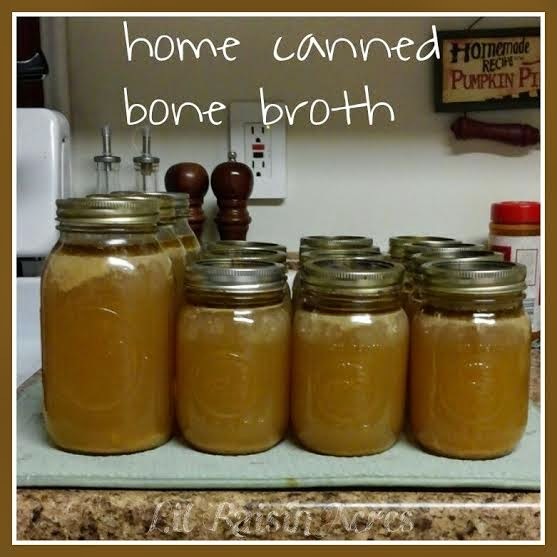 There is quite a bit of information out there online concerning the health benefits of bone broth. It makes an excellent medicinal base for soups during cold and flu season, and it's delicious! Making your own is definitely worth the effort! * I used carrot peelings and tops, celery leaves and root ends, onion tops and bottoms. Onion portion should be equal to no more than one medium onion. Put bones, veggies and garlic in a large stock pot. Pour enough water into the stock pot to just cover the bones and vegetable scraps. Bring bones to a boil. Turn heat down til the pot is just at a simmer, and continue to simmer for 12 hours. Add herbs and spices and simmer for an additional 30 minutes. Let the broth cool til able to be safely handled and strain broth using a fine mesh strainer or colander to remove bones and vegetable scraps. Some tiny bits of meat and herbs may not be strained out, that's fine. You may want to let it cool enough to remove solidified fats from the surface if you are using beef bones. Reheat the broth just to a boil, and fill sterilized canning jars leaving 1" head space. Process the jars of broth at 11 pounds of pressure for 20 minutes for pints, and 25 minutes for quarts. A 3/4 full 23 qt stock pot of bones and veggie scraps made 9 quarts of broth. Dear Readers, I have not abandoned you! It's been an interesting couple weeks around here, that's for sure! Then there was the unexpected truck repair. We know that it needs brake shoes ASAP, but we didn't expect the CV joint to crap out on his way from work! The money we spent on the truck repair was supposed to replace that broken faucet. 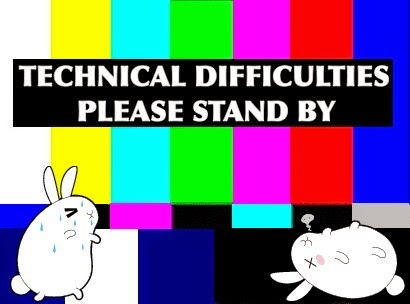 Then the whole reason we are having the technical difficulties in the first place occurred... After over 20 years of owning pagers and cell phones without any problems whatsoever- Someitme during the night, my bedside water glass spilled onto my phone, which was plugged into the charger. I can turn in on briefly, but it begins to overheat right away, and it will not charge. Totally shot. You don't realize how much you really do rely on your smartphone til it's toast. I take and edit all of the photos for the blog with it, and update Instagram/Twitter/Facebook with it! The phone/texting issue isn't a problem at all- I can get a SIM card for Brian's older Android phone til I'm eligble for an upgrade. BUT, social media updates are an entirely different issue. It's not ALL bad around here though! There's plenty of good news as well! The duckies have moved in with Baa, Opie and Daisy for the time being til we can get out and pick up their house from my parents. We're making them an enclosure with a doghouse and kiddie pool in it all to themselves! Brian built the cheepers a brooding cage out in the barn til they're ready to be introduced to the adult birds. The cage will be used for sick/injured birds once they move out. The vast majority of our seedlings are doing well. Summer Savory and Bee Balm sprouted fine, but didn't make it. I have never grown these before, any advice is helpful. I may just go ahead and try direct seeding and see what happens. I had 2 whole Lavendar seeds germinate out of 18, and 1 Spearmint out of perhaps a dozen or so. Not sure what the deal was there. I should perhaps contact Baker Creek about the problem, perhaps they have a solution? We bought a disc to enlarge the garden, but it's not working out as well as we'd hoped. Brian's coworker kindly has offered to let us borrow his large tiller in exchange for some eggs and produce this season. After the grass has been broken up, the disc should work just fine, though! We're thinking about purchasing straw for mulch. At $2.50 a bale, it can't be beat. I'm still on Twitter doing #Foodiechats and #gardenchat every Monday night starting at 8PM ET if you'd like to join in on the fun! Lots of great recipes and gardening tips! What beautiful weather we had this first day of April! 62 degrees! This is the warmest day we've had in the last 6 months. So warm, in fact, that we were able to take the little duckies (who aren't very little anymore!) outside for the first time! The little ducks had quite an adventure indeed, Drumstick tried to bum rush them, and Specker tried to mate Duckie (who is presumably male based on his call and what appears to be a drake feather...). Needless to say, he got chased away across the yard and has decided he wants nothing to do with ducks anymore! The hens were indifferent, and only Opie tried to sniff them. 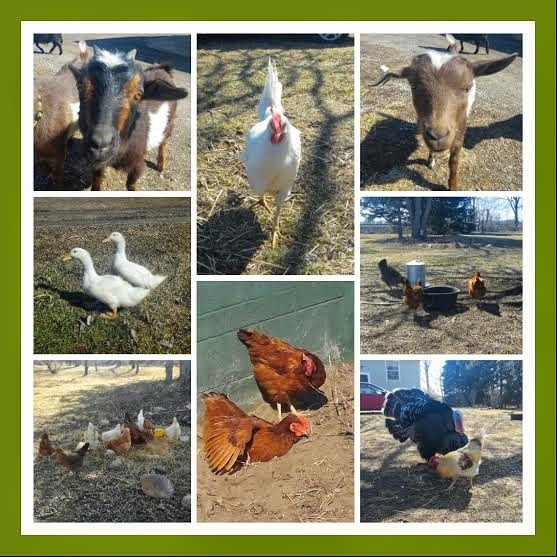 We don't have their pen completed, but they definitely needed some time to stretch out in the sun! I raked out the perennial area of the herb garden, too. Oregano, Thyme, and Chives are doing well, and Sage finally appears to be coming around. Hoping the Tarragon and Mint made it, but see no signs yet... The Lamb's Ear and Plantain are already emerging in the yard, too. After the sun went down and everyone was tucked away, I put up the second greenhouse shelf we bought this week. So many seedlings, so little space! I put the cover on the second one, hoping it will hold in enough heat to get the rest of these peppers to germinate, as well as the tomatoes I'm going to start in cling wrap covered egg cartons when I'm done here! On a side note, I found 2 of the 5-week-old chicks out of the box and one perched on the side this morning... They are pretty much fully feathered, but not quite ready to go outside yet, either. How are your animals and seedlings doing? Let us know in the comments! If you'd like to see additional, full sized photos of today's adventures, please visit our Spring 2015 Album HERE. I'm also active nearly daily on Instagram.